Gardening, water aerobics, CrossFit training, powerlifting, walking around the mall, cleaning up around the house–just find something you like and do it. Experts say it’s all the same. This is horrendous advice, which may be why the “experts” who give it are less effective than abstinence-only sexual education. First, who is the target audience? If the activity-admonishers are addressing people who already exercise regularly, what’s the point? The active do not require experts to tell them to keep exercising. On the other hand, if the experts are directing this advice to the sedentary, how could it be effective? Telling the chronically sedentary to do whatever exercise they like is like telling the illiterate to read whatever they like. The illiterate do not know what they like to read. And the chronically sedentary do not know what exercise they like to regularly do. You are trying to sell your home. You put it on the market for $400,000. No takers. So you lower it to $300,000. Still, no serious offers. Anxious to move, you set the price at $150,000. Finally, desperate to receive any income at all, you put a sign out in front that says, “Squatters Welcome, Pay on Honor System.” And still, your home and donation jar remain empty. Such perverse bargaining characterizes the history of “expert” physical activity guidance, which is usually what filters down to the public through the popular media. Over the past 45 years, exercise “experts” have downgraded their advice from relatively intense cardiovascular training to “moderate intensity” painting and fishing, to now standing in place. Still, 83 million Americans remain completely sedentary. And millions more otherwise fail to meet the low government standards for activity. This mode of thinking is no longer in vogue. Throughout the 1980s and 1990s, the ACSM and AHA lowered their standards. Hoping to increase the public “acceptability” of their guidelines, they de-emphasized the role of intensity. But what does “moderate-intensity physical activity” mean? According to the 1995 ACSM/CDC guidelines, it includes painting, pingpong, fishing and cleaning up around the house. You thought you were taking out the trash, but in reality you were satisfying your government-prescribed dose of moderate physical activity. Over the years, activity guidelines became more lenient in other ways. Instead of daily 30-minute bouts, they allowed smaller instances of activity to add up to a set weekly total. If the intent behind these guidelines was to prevent chronic disease, they failed miserably. Between 1972 and 2014, the percentage of Americans diagnosed with diabetes increased from 2 to 7 percent. The percentage of adult Americans with obesity jumped from 14.5 percent to 36.5 percent. 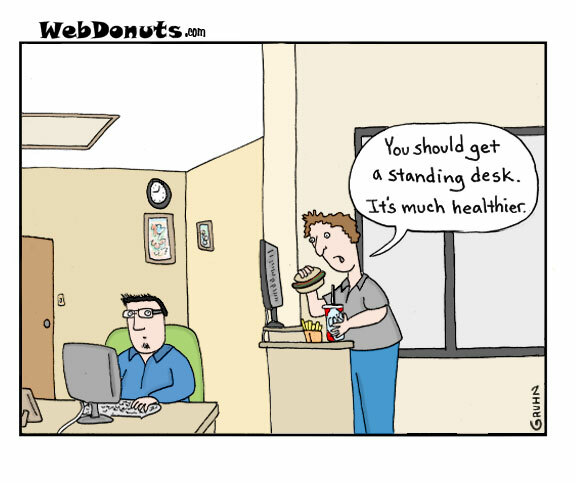 – Get a standing desk, treadmill desk, or exercise ball in lieu of a chair. – Walk, don’t drive, to a favorite lunch spot. – Stand when talking on the phone. When the activity “experts” promote standing and winking as physical activity options, exercise guidance is in a dire spot indeed. Surely this shameful history of exercise guidelines has nothing to do with the unmitigated influence of Coca-Cola and Pepsi on the research, institutions and personnel behind them. Would the activity-admonishers advise us to eat whatever we like as long as we avoided starvation and obesity? Even the most committed proponents of “energy balance” also remind us to get enough vitamin C, fiber, etc. The fact is, humans have physiological requirements we must meet in order to stay alive and healthy. These include various vitamins and minerals, essential fatty acids, some protein, etc. To be sure, a wide range of human diets can sustain health and fitness, but they all must contain adequate levels of these essential nutrients. Live off of Pepsi and ramen noodles for a few months and you are likely to come down with scurvy. Cut all the fat out of your diet and you will become highly vulnerable to infection and disease. Similarly, nutritional excess will sicken and then kill you. Chronic excessive alcohol and/or soda consumption leads to fatty liver disease, for example. So “Eat whatever you like, as long as you avoid starvation and obesity” is horrible advice. Yet is it any different from the standard prescription for physical activity, “move however you like, as long as you avoid becoming overweight or obese”? The unfortunate reality is that we humans have physiological requirements for physical activity, as well as food. For example, swimming and cycling are great forms of exercise, but if that’s all you do, it may not provide enough joint impact to maintain bone density. Bone density requires particular stressors to develop and/or maintain. So do muscular strength, cardiovascular endurance, balance, speed, etc. We all require baseline levels of these aspects of fitness in order to maintain healthy, independent living, whether we like it or not. And only particular forms of physical activity will develop them. None of this means that you have to train for the CrossFit Games to be healthy, or that there’s only one right way to be active. It does mean, however, that “exercise however you like” is irresponsible and ineffective advice. Activity has consequences. Is it really realistic to imagine regular people working out intensely, though? And don’t our activity-nudgers have a responsibility to recommend types of activity that people will actually stick with? Well, initial research suggests that people who begin to engage in “high intensity functional training” (wink, wink) actually “spent significantly less time exercising per week, yet were able to maintain exercise enjoyment and were more likely to intend to continue,” compared to a group that did a traditional routine quite similar to those recommended by the “expert” activity guidelines. This will make sense to anyone experienced in relatively intense training. Yes, Tabata squats are harder than working at a standing desk. On the other hand, doing hard workouts in a group provides two factors that promote compliance: results and community. You can’t say that about standing desks. Fifty years ago I ran cross country and track for a state champion team. The reason we were so good is that our coaches learned about a new training technique called “fartlek” which means interval speed training in Swedish. I ran against Jim Ryan and he set the world record in the mile in high school using this type of training technique. -Detoxify your body for fast weight loss. -Drop pounds and inches fast, without grueling workouts or starvation. -Lose up to fifteen pounds in the first three weeks. -Shed unwanted fat by eating foods you love, including carbs. -Get rid of stubborn belly fat. -Eat foods that give you glowing, radiant skin. -Use green smoothies to detox. -Trigger your six fat-burning hormones to lose weight effortlessly. -Eat so you feel energetic and alive every day. -Get physically active without exercising. This definitely is my kind of book, but I can’t see wasting money on the book because I already know how to do nothing. I also recommend reading A. J. Jacobs book “Drop Dead Healthy: One Man’s Humble Quest for Bodily Perfection.” By the wat, Jacobs is a big fan of the standing desk! You can clearly see the results of this “do whatever you want” culture when it comes to diet and exercise. Simply look around you and search for people who are thin, robust and healthy looking. Good luck with that!